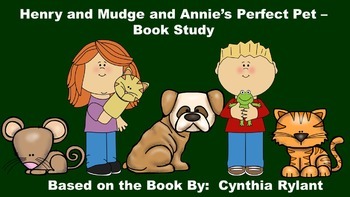 **Glossary Page - The students will make a glossary based on some of the vocabulary words from the book. They can look the words up in a dictionary, online dictionary resource, or they can be discussed with the class/reading group. **Sequencing Strips - The students will cut out paper strips that contain five events from the story and paste them in the order that they happened. 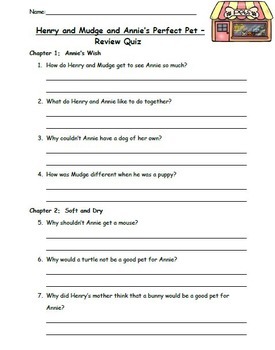 **Main Idea Chart: The students will use this page to record the main idea of each chapter. 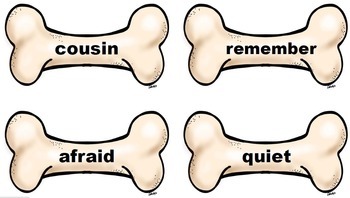 **Dog Bone Word Cards: There are sixteen cards. Nine of them are from the vocabulary word list and the others are words in the story. Some ideas for these cards could include: ABC order, use the words in sentences or a story, draw the meaning of the words, sort by part of speech, and dictionary skills. They could also be enlarged and posted in the classroom.